A total of 257 migrants were brought to Malta on two patrol boats this evening after having been rescued from a sinking ship by a cargo ship. 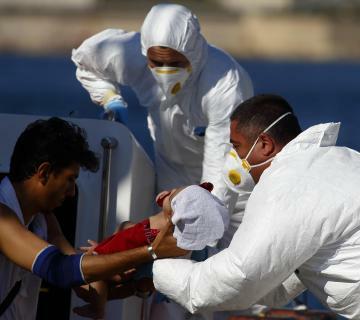 Two migrant men, a woman, an infant and a six-month-old baby, all belonging the same family and all from the same group, were brought to Malta on a fast rescue launch earlier because of the deteriorating medical condition of the baby. The launch, Melita II, arrived at the AFM maritime base at Haywharf at about 4.45 p.m. An ambulance was waiting for the migrants.. The first of the patrol boats arrived in Malta at 4.45 pm. On board were 140 migrants, including 22 children which officials said was a larger group than usual. The second patrol boat arrived some time later with the remaining migrants, including 10 children. The migrants claimed to have come from Syria, Iran, Iraq, Palestine and Senegal. Figures released by the UNHCR two days ago show that just 308 migrants arrived in Malta so far this year, a sharp decrease from the average of 1,400 annual arrivals recorded since 2003.